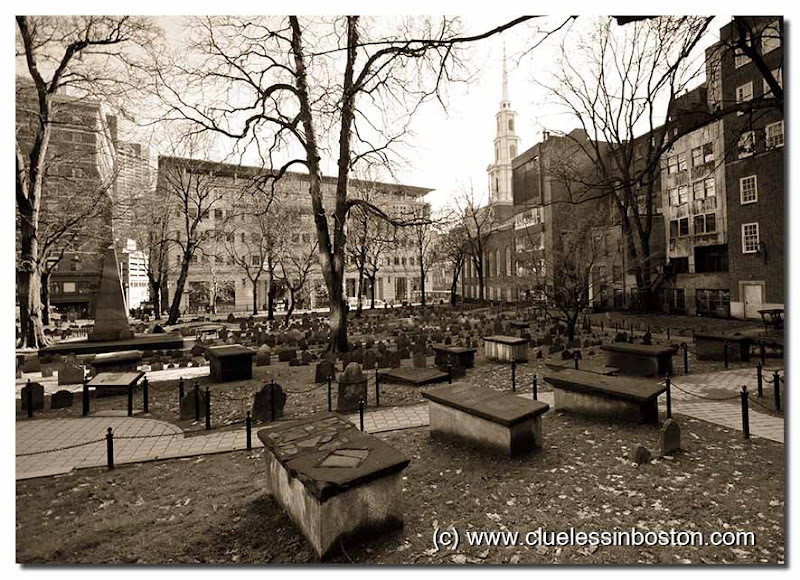 Founded in 1660, the Granary Burying Ground is the city's third-oldest cemetery. Located on Tremont Street, it is the final resting place for many notable Revolutionary War-era patriots, including three signers of the Declaration of Independence, Paul Revere and the five victims of the Boston Massacre. The cemetery has 2,345 graves, but historians estimate as many as 5,000 people are buried in it. The cemetery is adjacent to Park Street Church and immediately across from Suffolk University Law School. More at Wikipedia. I like the almost sepia texture to the photo. It's superb photo and superb place! Any Revolutionary-era Brits in there? Nice image, Clueless. I always thought it was charming to see this very old graveyard amidst a bustling modern city of highrises and commerce. Strange to see such a place among a modern district. And fabulous that it could survive through centuries! Sepia was a good choice. This is my second favorite cemetary in Boston, Copp's being first. I love how this is right in the middle of things- The city grew around. I like this perspective, looking out rather than a touristy peaking in from the streets.